What are the latest trends in conveyor systems and technology? Conveyors are continuing to play a greater role in robotic applications. Robotic movements are precise and exact – conveyors need to operate to that same level of accuracy. Robotic applications often require product to be in an exact spot on the conveyor at the right time. But to do that successfully requires a conveyor system that’s efficient, reliable and engineered to work in conjunction with robotics. Not every conveyor can do that, but Dorner can. Our servo motor Precision Move conveyors deliver accurate alignment of time and distance that provide indexing repeatability of +/- .040”, all at a rate of 100 indexes per minute. It’s important to select a conveyor supplier with knowledge, application insight and the proven expertise in working with robotics, and that supplier is Dorner. Is today’s trend toward flexible assembly lines affecting conveyor design? Conveyor design is certainly being affected by the continuing trend of flexible assembly lines. When customer demands change and product cycles end, assembly lines need to be flexible to accommodate different applications. The supporting conveyor system needs to be just as flexible. Modular conveyors are mobile and can be easily moved from one line to another. When this occurs, the conveyor’s guiding, transfers and other accessories may need to be adjusted. A well-designed platform allows this to happen in only a matter of minutes. What are Pallet System Conveyors and how are they used in manufacturing, assembly and robotic applications? Automation is now a prime driver behind the way products are being produced. Many applications now rely on robotic interaction, and as such, conveyors today need to be engineered to meet these challenges. That’s why our pallet system conveyors have become a popular choice. Pallet system conveyors are ideal for many automation-focused applications that require exact movements and positioning of parts, as they can be setup or programmed to start and stop at specific intervals to sync up with robotic interaction or other processes. These types of conveyors dominate in automotive component manufacturing, as well as other industries including medical devices, electrical and electronics, and product testing/inspection that call for automated and manual assembly or handling of products. Pallet system conveyors are available in multiple styles such as dual belt configurations powered by common drives, and flexible plastic chain belt designs. Our innovative lifting modules can be used to interface with robots, change product orientation, or rotate product 90° or 180°. Companies using a pallet system conveyor are also doing so for the accuracy. They need their product at an exact location, and the conveyor’s lift and location station deliver repeatability of 0.002”. Pallet systems are available in a variety of layouts including tight turns, heavy load applications and Vertical Transfer Units. How can conveyor systems improve assembly applications? What are your goals and objectives for your processing/assembly line? What is the products that need to be moved? What is the weight, size and packaging of the products? What is the rate of production for the application (desired speed of the conveyors)? How are the conveyors going to integrate with other equipment/machinery on the line? Are there any product transfers involved? What is the projected product flow of the application (sorting, accumulation, curves, inclines, declines etc.)? What type of environment will the conveyor be operating in? If it will require cleaning, how extensive does that cleaning need to be? Will robotics be integrated with the conveyor system? All components within an assembly automation application, including conveyors, should work together to best augment the overall operation. Answering those questions will help you take a critical look at your conveyor system to determine where improvements in product flow and handling can be made. How important are the availability of replacement parts in keeping conveyors operational? Conveyors are critical components for an overall assembly line. If the conveyors go down for maintenance, they take your entire production line with it. That’s why it’s important to keep the right parts in stock…but which parts? Here are a few steps to get you started. Check the list - Whether you have a custom conveyor or not, manufacturers like Dorner often include a list of recommended spare parts with each model. You can order specific kits or bundles for pulleys, belts and other common replacement parts, which having on hand reduces conveyor downtime. Get a parts audit – A parts audit helps you develop a parts plan by streamlining the inspection, repair, and maintenance process for your conveyor system. Dorner can perform a parts audit, prepare a recommended parts list and a report of any pending maintenance concerns. Answering these questions will help identify which parts are needed for a bench stock, and also formulate a practical plan to help keep your conveyors running trouble free. What types of features are companies looking for in conveyors today? A lot of different conveyors have distinctive features to them that are truly application specific. Having a thorough understanding of specific types of conveyors available will help in designing a system that best accomplishes your production goals – and this is something that we can assist with. 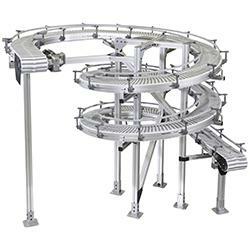 Conveyors today are built to your specifications to improve efficiency and output of your production line. There’s no reason to settle for a conveyor that’s being shoe-horned into your application, especially when a system can be engineered to seamlessly integrate into a larger process. Dorner's 2200 Series SmartFlex Helix Conveyor's compact, flexible design and small footprint maximizes valuable floor space while providing customers with flexibility in layout. The custom infeed and outfeed lengths allow the conveyor to extend beyond the spiral, reducing the number of conveyors required. The Helix Conveyor is ideal for applications including accumulation, buffering, cooling between processes or machines, and more!